This class can compute the number of boxes that fit in containers. It can take the dimensions of boxes to be shipped in containers, as well the weight and total number of boxes and display the number of boxes that fit in containers of 20 feet, 40 feet or 40 feet HC. 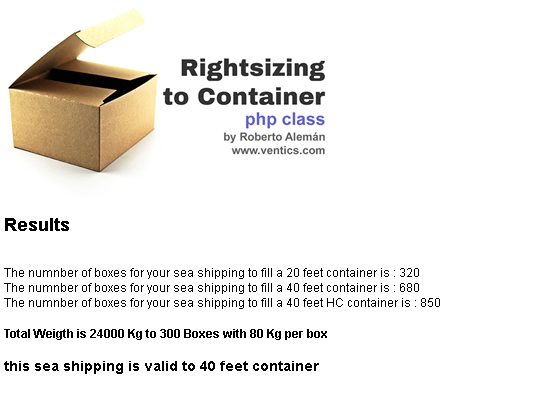 The class can also compute the total weight of all boxes and tell of the whole shipping fits in containers of 20 feet, 40 feet or 40 feet HC. Prize: One downloadable e-book of choice by O'Reilly Transport containers have standard sizes and weight limits. If you need to fit as many boxes as possible in a container, you just need to know the box dimensions and weight. This class can figure how many equal boxes fit in standard shipping containers given the dimensions and weight of each box. The class suggest a result based the dimensions and weight of the box, relative to the space available in standard maritime shipping containers ..